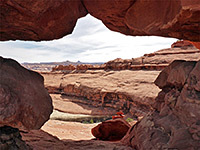 The five mile Peekaboo Trail explores some of the western section of the Needles in Canyonlands National Park, a generally less visited area than the central portion, around Chester Park, though the scenery is similarly spectacular. Starting from Squaw Flat Campground, the path, which is fairly level overall, traverses a grassy plain then crosses one drainage (Squaw Canyon) and a red rock ridge, before dropping down into a tributary of another (Lost Canyon), which is followed down to the main streambed. 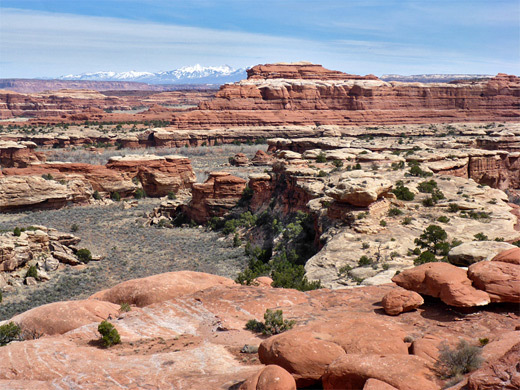 In contrast to these sometimes enclosed surroundings, the second half of the hike is nearly all along high red benches, at the foot of a thin, vertical-sided ridge, with sweeping views to the north, across a huge area of red and white formations towards the La Sal Mountains. 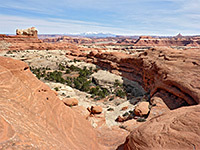 This is the only extended traverse of high elevation terrain in the Needles, as other routes either follow canyons or cross basins. At the far side of the ridge, the path descends steadily, aided by a ladder at one point, into the larger canyon of Salt Creek, where it ends at a junction with a 4WD track, just beyond a large panel of red and white pictographs. 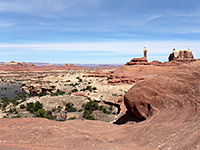 The landscape en route is varied and the views are excellent, especially along the red rock bench. 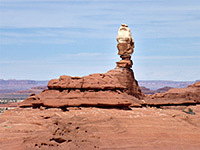 Wildflowers are rather limited, however, owing to the generally dry and exposed terrain, and the hike is not recommended during the hot summer months. Peekaboo Spring at the end of the trail may have water but elsewhere all is usually dry. Topographic map of the Peekaboo Trail. 23 views along the Peekaboo Trail. The trail begins at a parking place in Squaw Flat Campground, near camp A, a trailhead rather less busy than some others in the area. A right turn after a hundred feet is a connecting path to Big Spring Canyon, while the main trail is straight on, heading southeast over sandy grassland, initially flat then just a bit more undulating. 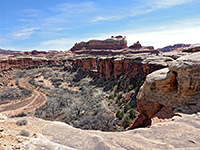 The path has a brief rise then descent to cross a slickrock ridge, followed by more sandy ground up to the junction, after one mile, with a south side path up Squaw Canyon. The streambed at this point is shallow, sandy and usually dry. The surroundings stay similar for a while on the far side, up to a small patch pine trees, where the path rises slightly, traversing bushier flats up to the base of a prominent ridge of white sandstone topped by red. A quick ascent leads up to the crest of the ridge, and the most extensive views of the hike so far, to the north and west. The next section is level, along a terrace beneath a line of cliffs then on a lower, white bench, descending a steep place via a short ladder, and dropping down further to the floor of a tree-lined box canyon, a west-side tributary of Lost Canyon, the confluence being half a mile east. Here the Lost Canyon Trail forks off to the south, upstream, later crossing a divide into upper Squaw Canyon, while the Peekaboo Trail continues by climbing the far side, at first through trees and boulders then up a slickrock gully with no vegetation, past a few residual pools, and across a minor divide to open slopes above the first of six small canyons which must be traversed, all the while staying on the red benches above. For the first canyon, the path loops around three sides at the upper end, and crosses another little ridge to the next, now in more open terrain where the northwards views are very extensive. After here is a longer traverse along the benches, running below a tall, sheer, east-west trending ridge that provides shade in the morning, heading towards a short fin at the far side of the fifth canyon. 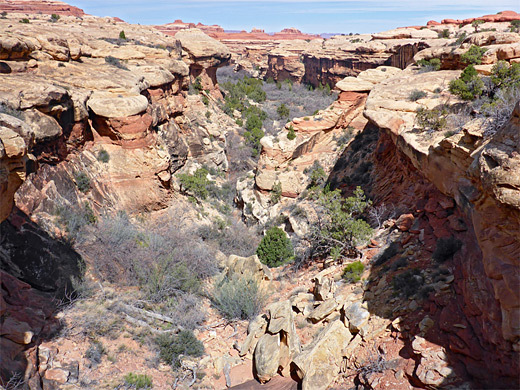 The path goes through a very short cave near the north end of the fin, rounds the final ravine and descends along a broad red ridge, moving back down to the underlying white sandstone layer, while giving the first views of Salt Creek Canyon not far ahead. 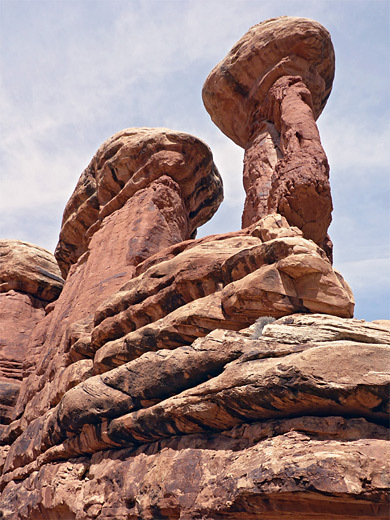 The path moves to a lower bench, past a few huge rocks that form big, shady cavities, at least one containing a small Ancestral Puebloan granary, then enters a ravine and descends a narrow crack via a 20 foot ladder, which takes the route below the cliffs lining Salt Creek. The final section follows the base of the cliffs, above some big sand banks, across a little rocky ravine then out along the north side of a narrow, vertical spur with pinnacles on top, to a gap at the far end where two paths descend a little further to the wide streambed, one through the gap, the other down a slope to the Peekaboo primitive campsite. 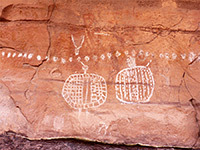 Just before is an extended pictograph panel, containing crisp-looking white designs from the Fremont period (around 1200 AD) beside much older and fainter red figures, plus several dozen handprints, in several colors. The canyon of Salt Creek is wide and sandy, not particularly interesting at this location, a place which may also be reached via a 4WD track, and vehicles can at most times of the year drive another 8 miles south, to the start of a trail through the narrower upper reaches.